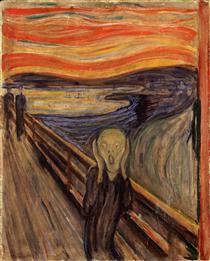 A Norwegian born expressionist painter, Edvard Munch lived a tumultuous life, which was represented in his paintings. As a child, he was often ill in the winter, and kept out of school. To pass the time, he spent his days drawing. He also had a troubled childhood, as his mother died of tuberculosis after the birth of his youngest sister, and his favorite sister died of the same illness nine years later. His father was also a bit of a religious fanatic, who would read Edvard and his sisters ghost stories and the stories of Edgar Allen Poe. 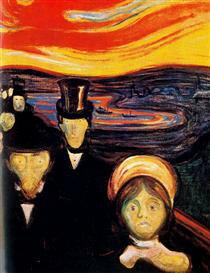 The vivid ghastly tales, combined with his poor health, the young Munch was plagued by nightmares and paranoid visions of death, which he would later incorporate into his artwork. In his teens, he moved from drawing and dabbling with watercolors to painting with oils, and he only spent one year in technical college before he left to follow his dream of being a painter. His early paintings brought much unfavorable criticism, and his father rebuked him for his artworks, but continued to give him a living allowance. Later, unhappy with Munch’s paintings, he destroyed one of his nudes, and refused to grant him any more money for his art supplies. Much live much of his life in a nihilistic, bohemian lifestyle, in which binge drinking and brawling were the favorite pastimes, to his father’s constant disapproval. 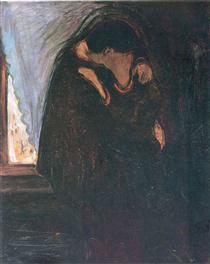 After his father’s death, leaving the Munch family destitute, and Munch, feeling that everyone around him had died, was plagued by suicidal thoughts. His personal tragedies and psychological idiosyncrasies evolved into a symbolic art form that expressed more internal emotion and feeling than projected an image of outside reality. 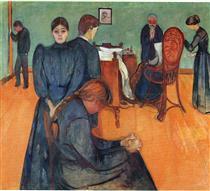 He often refused to sell his paintings, calling them his children, and so would create reproductions of them to sell. His critical reception improved by the 1890’s, and the attendance to his exhibitions increased, although reviews remained bleak. In 1898, he began a relationship with Tulla Larsen, who wanted to get married. Munch, fearing marriage as much as sexual relationships, fled Tulla a year later. In a later reconciliation attempt, there was an argument in which a gun went off, injuring two of Munch’s fingers, and ruining Munch’s chance at marriage. In 1908, Munch had an acute break with reality, seeing hallucinations and suffering feelings of persecution, as if he was on the brink of insanity. He began therapy, including a controlled diet and electrification, which stabilized his personality. Thus began his more financially and professionally successful phase in his life, where he received many commissions and was able to provide well for his family. He spent the last two decades of his life in relative isolation, painting at one of his many estates. Today his legacy, once smeared with rumors that he was a Nazi sympathizer, includes many robberies of his works, his prices at auction, and his face now being featured on the Norwegian currency. Edvard Munch (/mʊŋk/; Norwegian: [ˈedvɑʈ ˈmuŋk] ( listen); 12 December 1863 – 23 January 1944) was a Norwegian painter and printmaker whose intensely evocative treatment of psychological themes built upon some of the main tenets of late 19th-century Symbolism and greatly influenced German Expressionism in the early 20th century. His best known work is The Scream, painted in 1893. 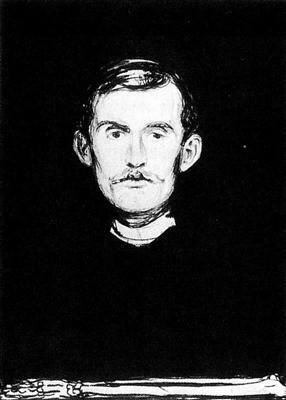 Edvard Munch was born in a farmhouse in the village of Ådalsbruk in Løten, United Kingdoms of Sweden and Norway, to Laura Catherine Bjølstad and Christian Munch, the son of a priest. Christian was a doctor and medical officer who married Laura, a woman half his age, in 1861. Edvard had an elder sister, Johanne Sophie, and three younger siblings: Peter Andreas, Laura Catherine, and Inger Marie. Laura was artistically talented and may have encouraged Edvard and Sophie. 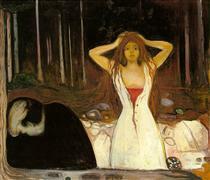 Edvard was related to painter Jacob Munch and to historian Peter Andreas Munch. As Edvard remembered it, Christian's positive behavior toward his children was overshadowed by his morbid pietism. Munch wrote, "My father was temperamentally nervous and obsessively religious—to the point of psychoneurosis. From him I inherited the seeds of madness. The angels of fear, sorrow, and death stood by my side since the day I was born." Christian reprimanded his children by telling them that their mother was looking down from heaven and grieving over their misbehavior. The oppressive religious milieu, Edvard's poor health, and the vivid ghost stories helped inspire his macabre visions and nightmares; the boy felt that death was constantly advancing on him. 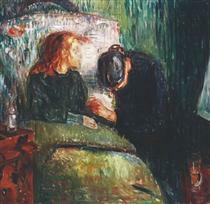 One of Munch's younger sisters, Laura, was diagnosed with mental illness at an early age. Of the five siblings, only Andreas married, but he died a few months after the wedding. Munch would later write, "I inherited two of mankind's most frightful enemies—the heritage of consumption and insanity."